Fall Job Search Series ~ FREE! RSVP: Appreciated, but not required. Drop ins welcome! Resume writing can be challenging. Come spend the afternoon getting support, hands-on help, and focused time to work on your most important job search tool. ** Bring your resume, laptop (if you have one), and pen/paper. • Critiques available to 5 people (please bring 5 resumes if you’d like a critique). • Brief, laser coaching from Laila on your resume, cover letter, brochure, etc. 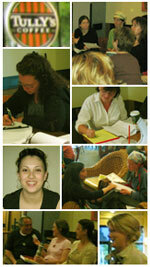 • 1.5 hours of personal resume writing time, in a supportive atmosphere. • Find out how strong your resume is, and get concrete tips for improvement. • Celebrate finishing 2017 with major progress on your resume! ** Bring 5 copies of your resume to receive a critique (available to 5 people). Send an email to , with "Register Resume Day" in the subject line. Preparation materials will be emailed to you. Send email with "Add to List" in subject line (see below). "10! Amazing! My favorite part was meeting new people, finding out how much we have in common and sharing ideas! ...I thought the whole workshop was well structured, flexible and the venue, relaxing. Laila is the best-upfront, respectful, supportive, encouraging!" Laila Atallah is a Seattle career counselor and life coach with over 15 years experience helping job seekers and career changers create the life of their dreams. She serves clients throughout the country and abroad through her business, Career Counseling with a Twist, located in Phinney Ridge. Read more. Self-Led, 6-week Support Group. First meeting led by Laila. Click here to see my photo gallery!